Every year, cheap boyfriends remind the world that Valentines Day is a holiday created by marketers to sell greeting cards. While we’ve been busy tuning out this complaint, the marketers at Amazon recognized it for what it was: a good idea. Now on its third year, Prime Day is a holiday created by Amazon to sell, well, everything. So far, Prime Day is an online success. It seems like every blog has a guide to the deals on display, and Twitter is alight with links to steals. We couldn’t help wondering though, is Prime Day’s online traction affecting offline sales? Are brick-and-mortar retailers losing out as customers stay home to page through deals? With just a bit of number crunching, we had our answer: Yes, Amazon’s Prime Day spurs some shoppers to take a break from brick-and-mortar competitors. To understand how Prime Day is affecting offline shopping at other retailers, we did a foot-traffic analysis focusing on traffic changes from day-to-day. This approach helped us weed out any seasonal effects as we built our baseline. Since this year’s Prime Day fell on a Monday, we focused on relative traffic changes from Sunday to Tuesday. We aggregated the foot-traffic for a handful of brands, sampling the previous four non-Holiday work weeks (The July 4th holiday fell on a Tuesday this year, resulting in many getting a day off on Monday, July 3rd, which resulted in some unique shopping patterns). So, what did we find? Amazon Prime Day does cause major hits in in-store visitation for its brick-and-mortar competitors. On any given week, foot traffic to Home Depot and Lowe’s spikes on a Monday compared to a Sunday. However, on Amazon Prime Day, weekend warriors are more inclined to buy their home-improvement needs online – leaving hardware stores with a 5 point drop in store foot traffic than normal. It’s typical for Big Box stores to see a dip in traffic on Mondays, but on Prime Day they see an additional 3-point drop. 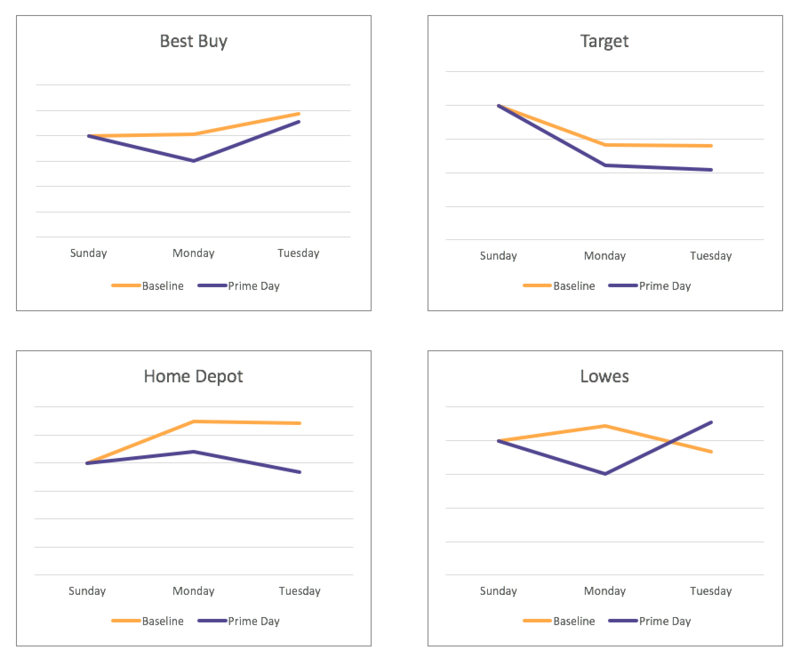 *These figures show the foot-traffic changes during the Sunday – Tuesday time period for a regular week, and the week on which Prime Day fell. Prime Day is no joke. You can see from the charts above Amazon’s holiday is chipping away at major – and longstanding – retailers. 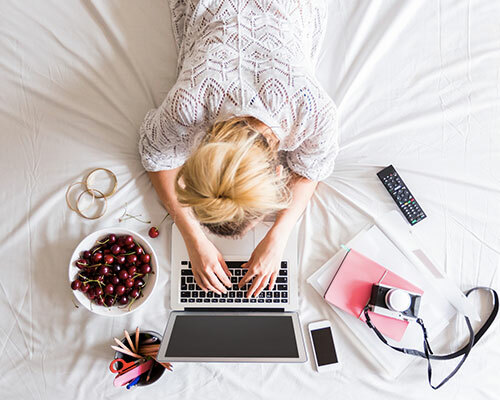 Prime Day – although purely an online shopping experience – is clearly making its mark in the offline world, stealing in-store foot traffic that would normally occur. This disruption will likely gain more and more momentum each year, as Amazon continues to tighten its grip on competitors (think: Whole Foods acquisition) and expand its Prime membership benefits (think: The Fix brand). And what will this mean for the current Ecommerce Big Leagues – Black Friday and Cyber Monday – which will likely be affected by ‘Holiday in July’ shopping done on Prime Day? Stay tuned for that analysis in a few months! So, what have we learned from Prime Day as we currently know it? Amazon is a retail behemoth that has turned the act of shopping on its head time and time again. And they are still getting started. For more cool stories like this, check out our Location Data Spotlight blog series.